Oberon, that chant is rubbish mate. I tried it and all I got was a wife and 12 kids that never stop draining me like leeches. The bastards. Slayer, he is fine, he just has the wrong chant for more presents. RedVeil, atleast your rotting flesh provides some lubrication. Tell me about it! I said it like 666 times and all I got was this lovely monitor for christmas. I mean that's great and all but where's the booze and government checks? Geeze, chanting ain't what it used to be. Don't think so. 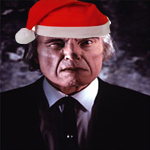 It is never time for xmas hats imo. Every xmas, you can count on it. I won't spoil any other party, tho'. Nice job, just don't expect me to change my avatar for it. I didn't ask for any hat. I don't like these hats. If you want to watch my avatar with the hat, you can look at the image you made.